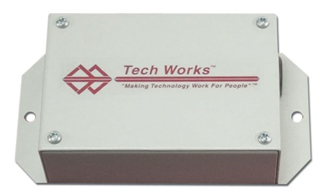 The Tech Works CC-CM-4 is an Intelligent Interface Module with screw terminals capable of supporting up to four passive push buttons and lights. The CC-CM-4 is a surface-mounting device constructed of cold rolled steel with a removable cover plate and is designed for use with normally open momentary contact closures. The first push of each button lights a steady or a flashing corresponding light depending on the “S” software selection dipswitch position. A second push extinguishes the lamp. With the “S” switch down, a normally open contact can be monitored, sending a Steady Light message to the network when the contact is closed and Off when the contact is closed a second time. When the “S” switch is up, a contact is monitored sending a Fast Flash Light message when the contact is closed and Off when the contact is closed a second time.